Our end of year talent show and trip to The Maypole restaurant. Happy summer holidays from everyone in Purple Class. Purple Class had an amazing time at Herrings Green Farm and Bird of Prey Centre. We all had a chance to hold Raquel a 6 year old owl who weighed the same as a packet of crisps! Next we watched an amazing flying display with storks, owls, falcons, eagles and spoonbills. After lunch we had a chance to meet the giant rabbits and Guinea Pigs, one of which was called Ed Sheeran. Finally we watched the critter show where we met a giant snail, a skunk, and African pygmy hedgehog. Thank you very much to all the wonderful staff who made us so welcome and looked after us so well. Purple Class have been for a woodland walk and bug hunt around Buttons Ramsey Woods. Well done to FInn, Jack, Helen and Hasan who represented Ridgeway School at the Flitwick Cricket Festival. We were lucky enough to have a session with Mark and Sarah from Sound Smiths. Purple Class really showed their musical talents by improvising, performing a call and response piece of music and working in two groups to perform a round. We had a great time, although some of us look very serious as a lot of concentration was required to play the different times, rhythms and note lengths! We all enjoyed celebrating the Queen's Sapphire Jubilee. We've been using our maths skills to solve real life problems as part of our Entry Level maths course. Congratulations to Finn who last week was the very proud winner of the trophy for 'Outstanding Achievement' at Boys Brigade. Well done Finn. Purple Class have been raising money for Comic Relief by wearing our favourite red things. Purple Class have had a busy week this week. 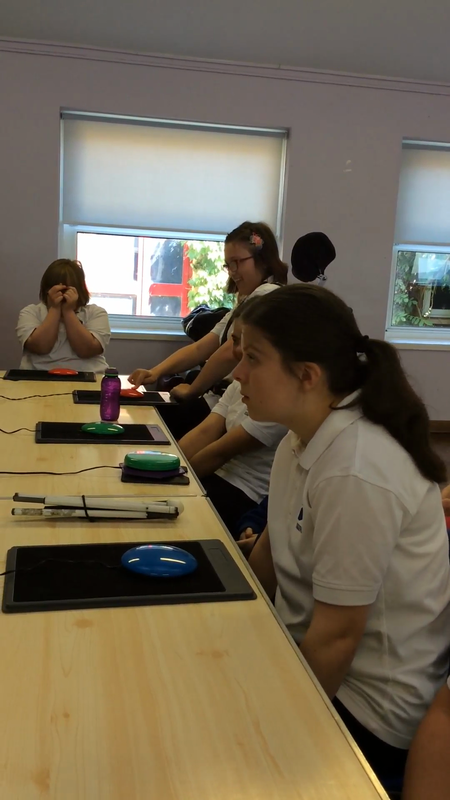 On Thursday we attended the Bedfordshire Music and Drama Festival Special Schools Day at King's House. Purple and Orange Class performed a song and a piece of music with Mark and Sarah from Soundsmiths and we all had a brilliant morning. Unfortunately no photos or videos were allowed to be taken during the festival. On Friday we went to MK Museum and had a brilliant time as you can see from the pictures below. We were guided round by Ian and Roy who let us touch and fiddle with all the exhibits which was amazing as normally in museums you aren't allowed to touch anything! Purple Class enjoyed celebrating World Book Day. Can you can guess the different characters or stories? Our new Purple Class relaxation area. Purple Class designed some imaginary classrooms including all the things we would like if space and money were no object. Unfortunately we're a bit short on both space and money so we took a few of our best ideas and went shopping to IKEA to buy a some things to make a cosy 'Chill Out' area in the classroom. We also met a very familiar face whilst we were there! Pictures of our new relaxation area to follow. Last Friday we performed a class assembly for the whole school on the theme of 'England'. Purple class were so amazing and spoke their lines so brilliantly we got a standing ovation from the audience! Happy New Year from everyone in Purple Class. Please find below an overview of the work we are covering for the this term. Purple Class have been starting our Christmas celebrations in style this week with our whole school production, Christmas Dinner number 2 and a trip to the theatre in Northampton to see 'Snow White and the Seven Dwarves'. All the staff and students in Purple Class would like to wish everyone a very 'Happy Christmas'. This week Purple Class visited the Maypole Farm restaurant in Kempston for our Christmas meal. We all had a great time and ate far too much food. A big 'Thank you' to all the staff who made it such a lovely outing for us and looked after us so well. Purple Class have been helping Ridgeway School to raise loads of money for Children in Need. We had a Mufti day with spotty cake decorating, spotty face painting and nail painting as well as lots of other fab activities around school. This week we have had Martin from the Oseyago Theatre Company in school doing African drumming. We were able to play real African drums all the way from Ghana which is where Martin is from originally. Martin taught us different rhythms and African songs and we all had a great time. On Friday afternoon we performed our whole school assembly on the theme of France and all things French. We spoke our names, ages and where we lived in French, ordered food and drink from a cafe, sang a French song and did the 'Can Can'! Today we celebrated our School Harvest Festival in style with a whole school assembly, followed by a MacMillan coffee morning where Purple Class (and everyone else) ate a lot of cake. However as it was all in a good cause this was allowed! We also brought in lots of donations for the Bedford Food bank so a huge thank you to everyone who supported us. This week we have been focusing on using question words in literacy. The students chose a member of staff who they would like to interview and then wrote their own questions. Not everyone has had a chance to interview their chosen person yet however Jack was able to interview Mr Allard and Molly interviewed Donna. Jack found out some surprising things about Mr Allard such as he is only 21 years old (who knew? ), likes pasta and curry and would like to visit Canada one day. Molly found out that Donna has a cat called Max who is 8. Hello and a very warm welcome to Purple Class. Our topic for this term is 'USA all the way' and we will be learning about the culture, traditions, geography and history of America. A lot to pack into one term! Our web page is updated on a fairly regular basis so please keep checking to see what we've been up to. This week we had our sports day which was held at Bedford Athletics Stadium where our students competed in teams with their friends from all areas of the school. It was a beautiful warm September day and a good time was had by all with everyone managing to win a medal. What a fantastic achievement!